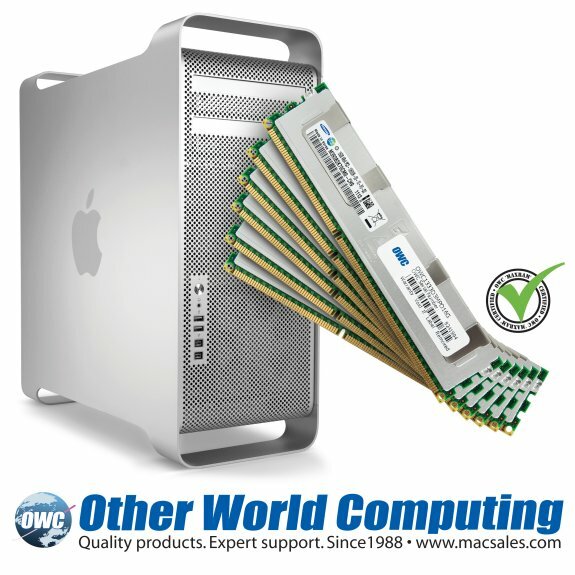 OWC has introduced the first 16GB DDR3 memory modules for Apple's 2009-2010 Mac Pro. Other World Computing (OWC®) http://www.macsales.com, a leading zero emissions Mac® and PC technology company, announced today its MaxRAM™ Certified Triple-Channel Memory Upgrade Kits are the industry’s first 16GB module based upgrades to provide up to 96GB for all Apple® Mac Pro 2009 (Nehalem) and 2010 (Nehalem and Westmere) models. These new 16GB per module kits are Fully Tested, Qualified, and MaxRAM Certified for the most demanding applications and backed by OWC’s Lifetime Advance Replacement Warranty. 3X more memory than the 2009 Mac Pro Quad-Core maximum factory option of 16GB. 3X more memory than the 2009 Mac Pro 8-Core maximum factory option of 32GB. OWC Memory Upgrades for 2009-2010 Mac Pro models are engineered with premium quality components and are designed to meet, if not exceed Apple Design Specifications, including use of Apple required thermal sensor EEPROM, JEDEC board design, and chip components; and are fully RoHS and JEDEC compliant. Like all OWC Memory Upgrades, the Mac Pro Upgrade Kits are backed with a Money Back Guarantee and OWC’s Lifetime Advance Replacement Warranty. By maintaining its own lab of nearly every Apple Mac model ever made, including all of the latest Mac Pro 2010 models, OWC continues its four year first-to-market streak as the first independent provider to test confirm and ship memory kits that double (and now triple) the factory memory options offered for the Mac Pro.